You will require a full British passport for everyone, including infants and children who are travelling. British passports can take a number of weeks to obtain. Some countries require up to 6 months validity on a passport from your return date. 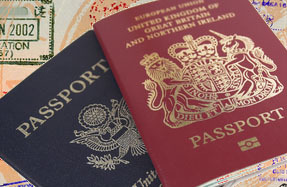 Should you have any questions relating to passports for yourself or anyone in you party, go to the government website www.direct.gov.uk and press passports, this should be able to answer them or direct you accordingly.